SunTech Automation, LLC. US made can seamers for food and non food applications. Quiet, highly reliable, ideal for production. 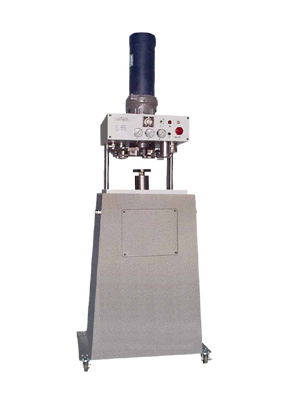 SunTech Automation, LLC produces two series of EZ can seamers for hermetic closing of heavy metal walled containers in environments from laboratories to volume production factories. Extremely quiet and clean in operation, they are well suited for applications requiring continuous operation around the clock with minimal maintenance. They are being used for sealing food containers, capacitors, sample cans, etc. and can accommodate a wide range of can shapes and sizes. These seamers have been proven in production environments closing millions of cans each with only simple routine maintenance. These seamers are being used to seam cans made with .031 stainless steel! All this for less than the cost of a reconditioned Ross or Callahan! If you need to close coffee cans, oxygen generator cans, capacitors, munitions containers, custom containers, or other metal or fiber cans, SunTech can closers can do the job. The LK (round and non round) and LR (round) series seamers use pneumatic cylinders instead of the cams found on traditional machines. This eliminates the need for periodic relining of a cam and provides consistent seam quality over a long span of time. The simplified design has fewer wear parts resulting in high reliability in high use environments. Unlike traditional machines represented by Callahan and Ross vintage examples, the LK and LR seamers use no clutches, pulleys, or belts. The motor runs only when actually seaming. The result is vastly quieter operation and greatly enhanced reliability. Operators require no ear protection and can converse in normal voices. Ease of operation SunTech Automation EZ seamers feature pneumatic pedestal lift for effortless operation with just the push of a button. The programmable controller insures precise, repeatable results can after can. The low height enables the operator to be seated for maximum comfort. Clean Unlike most conventional semi-automatic seamers, the rollers and associated machinery do not rotate around the can. This means no throwing of grease and oil from rotating parts that can splatter the operator and the surroundings. No shields are needed to maintain a clean area. Precise set up Both rollers can be easily and independently adjusted for precise height settings to insure optimum seaming quality. Additionally, each roller pressure can be independently set from the operator's position by turning a knob to obtain the best possible seam. Light weight Unlike its bulky cast iron predecessors, the EZ series of seamers is lightweight and can be easily moved on its casters to allow flexible shop space setup. The small footprint means it can be placed most anywhere. Proven reliability The EZ series of seamers has been extensively proven in 24 hour continuous production of millions of cans per machine with no more than routine maintenance. With few wear points and conservative design, these seamers will provide years of reliable operation.